Hey Coffeeholics! Its SALE ALERT again. Converse Philippines is giving us a Pre-Holiday treat. 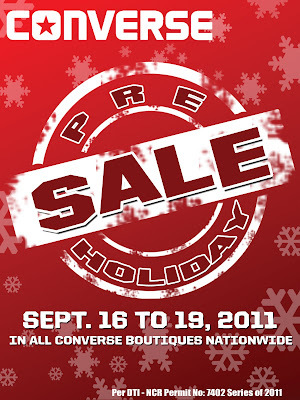 They will be having a nationwide sale in all Converse Boutiques from September 16 to 19, 2011. So wanna avoid the Christmas shopping rush? I suggest you check out the Converse Sale and grab this opportunity. Wanna be updated? Visit Converse Philippines Facebook Fanpage and be informed on what's latest in Converse. Have twitter? Follow @Converseph to be on the know on Converse promos and features. So Coffeeholics, have you started your Christmas Shopping na? Or is it Christmas "savings?" Let's swap ideas! Comment away!